A study of the region provides a look at post-World War II reconstruction. It is a microcosm of “Cold War conflict” and can serve as a case study on emerging nations and European reconciliation. It also begs that we ask truly important questions – of ourselves and of each other. How do communities make sense of and respond to catastrophic events? How do historians interpret catastrophic events, and community responses to them? How can a region that has contributed artistic and scientific genius to the world at the same time be the source of devastating war and genocide? Most public schools only cover the history of Ancient Greece, Rome, and the Ottoman Empire. Mandatory history classes do not provide much more than a cursory overview of the modern Balkans and how it relates to World War I, II, or the mass violence of the 1990s. But history is full of stories that can become, if well told, everyday reminders that life is fragile and freedom must be nurtured and cherished. Ordinary people make a huge difference to history by their actions and their inaction, their engagement and their indifference, their humanity and their inhumanity. 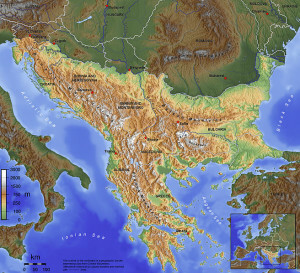 A historical case study on the Balkans that includes stories little known and rarely shared in a high school class would allow students to grapple with issues of political and economic tension, war and its aftermath, reconstruction, peace studies, and regional foreign relations. This summer, with support from the innovation grant, I will travel to Greece to study the area as I develop the unit. I plan to visit places like Zakynthos, an island in the Ionian Sea. During World War II, the town’s mayor Loukas Karrer and Bishop Chrysostomos refused Nazi orders to turn in a list of the members of the town’s Jewish community for deportation to the death camps. Instead, they hid the town’s 275 Jews in rural villages and every Jew of the island survived the Holocaust. What makes certain people stand up against hatred? What causes everyday people to take extraordinary risks to protect others? I hope to uncover some truths to questions like these and learn the stories of Zakynthos’ upstanders to better understand this difficult moment in history. It is difficult to study modern Greek history without discussing the place and role of the Jews in it, and in doing so we can begin to answer questions like: Why should we teach about the Holocaust to learn about modern Europe? How do Greeks understand the legacy of the Holocaust? How do non-Greeks understand and respond to what happened in Greece during the Holocaust? I believe this project will meet a need for teachers interested in incorporating other stories of the Holocaust into their classes and creating a broader understanding of modern Europe so that students can gain a better sense of how this history affects them economically, geopolitically, and culturally today. Have you created a multimedia teaching unit? Comment below and share! Teaching for over 10 years in suburban New Jersey, the main focus of Andrew's academic interests in history revolve around the National Socialist era, post-World War II Europe, Israeli politics and relations with the Palestinians, and Scottish nationalism. Hailing from the Northeast of Scotland, his other fanatical indulgent vice is his insanely one-sided devotion for his football team - Aberdeen FC! He is the recipient of a 2013 Margot Stern Strom Innovation Grant from Facing History and Ourselves.